AFTER THREE MONTHS OF WINTER, it’s time to start planning for the annual rite: spring cleaning. Those who set out to do a major spring cleaning project usually take a week to complete the tasks on their list. While women will do half of the work, men and children are also being assigned work. Spring cleaning priorities for most are the bedrooms, bathrooms and kitchens with ceiling fans, windows, and blinds being the most often cited projects. Many households take advantage of the spring cleaning momen- tum to organize a cluttered closet or attic or to reorganize their bathroom and kitchen. It is actually a good idea to sort through a room before beginning to clean. Assess the functionality and condition of everything from clothing to linens to toys and divide them into boxes for trash, sell/donate, mend or store. Off-season clothing, sports equipment and linens should be stored away and replaced with summer items. This may involve trading out flannel sheets and down comforters, switching kitchen linens and bath towels and even rotating artwork or dishware. If you don’t have storage space in your attic, basement or garage, consider renting a self-storage unit for these items. The most effective way to get through spring cleaning is to have a written plan. After all, you will want to do the usual chores like dusting, vacuuming, scrubbing bathrooms and mopping floors along with seasonal tasks like windows, grout cleaning and cleaning inside cupboards. Having a list for every room is a good start. Then decide whether you want to go room by room or task-by-task. For the latter, you would dust all the rooms, then vacuum all the rooms, then do room-specific tasks. You should also indicate on the schedule which family member is responsible for which task. 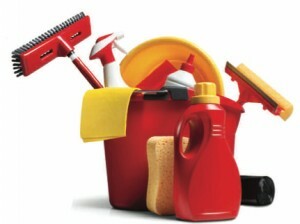 For more information on spring cleaning or other tips, visit www.storagewest.com.